Woah, it’s almost November! Halloween is right around the corner, Sweden’s getting really cold, really fast. In times like these, one would almost prefer being stuck on a raft in the middle of a tropical ocean. Here at the Raft HQ the radiators are heating up as we tap away at our keyboards and sculpt on our creations. It’s time for a new blog post and we’ve got some fun stuff in store! Lets dive right in, shall we? 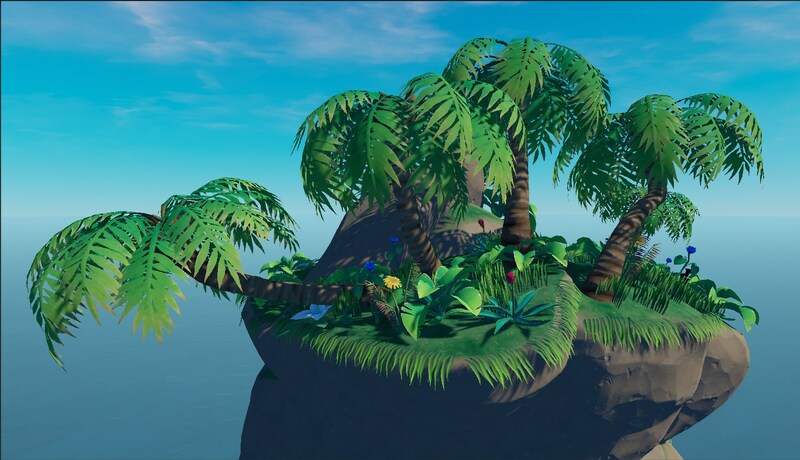 The islands needed some more vegetation and the palm was in need of an update, so why not do both? These trees can be found on the islands and harvested for resources. This is also where you’ll be able to find seeds to plant your own palm trees from now on. When we started implementing the reefs the rock models that make up the reefs were made quite quickly in order to be able to try it out. Now we felt we had to give them some more love and decided to remake them all together. Shown below are the rocks without any decorations or resources, so they’ll look nicer once they get a coat of flora and vegetation. 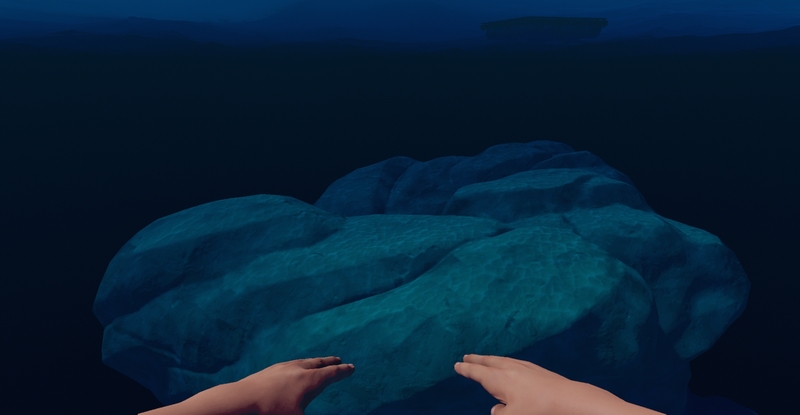 Now that you’ll be able to stumble onto islands, there’s a chance you’ll get stuck on the rocks. You really don’t want to get shipwrecked and forced to live on a small island for the rest of your life so make sure to bring a paddle in case you have to row yourself free! We’ve kind of teased you with the flowers and the paintbrush, and we’re finally ready to show you how it’s all connected. 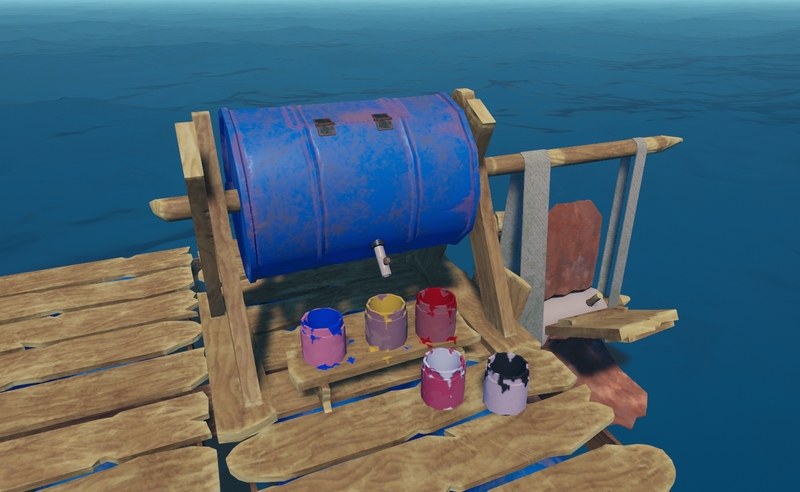 You might have figured it out by now, so it might not be much of a surprise, but it is now possible to paint your raft to your liking! We’ve seen you build some amazing things with what was available in the prototype so we can’t wait to see what you’ll do in the early access! Maybe you have some ideas already. If so, please tell us! In order to paint you of course need to gather something to make color from! That’s what the flowers are for, as we know some of you figured out. When you’ve picked a flower off of the mountainside you will have to process it somehow and make it into color. That’s what the Paint Mill is for! This amazing thing will use the power of the water as you float around to turn flowers into paint! If you’re lucky you’ll get seeds from the flowers so that you can start your own flower farm and produce even more paint. If you’re wondering what the strange words are down to the right in the gif above, that’s just us testing localization with the Swedish language. There are five base colours. Red, Yellow, Blue, Black and White. Once you’ve got some paint and you’ve crafted a paintbrush you’re ready to start painting! 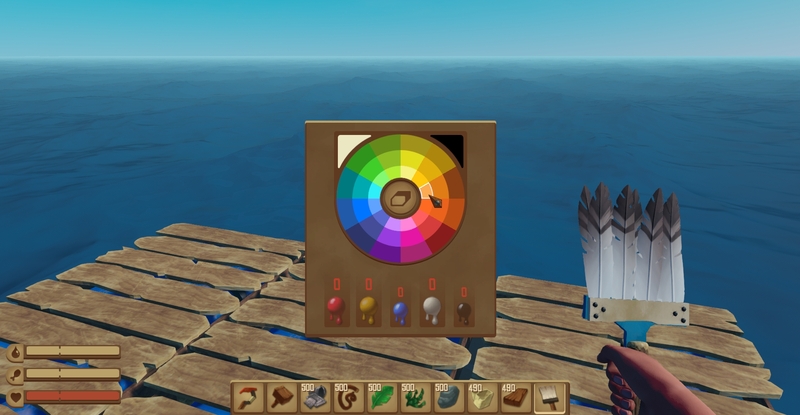 By using the color wheel you can choose between a bunch of different colors and the paint is mixed automatically! Right now it’s possible to paint all the building blocks, but we plan to add functionality to paint the crafted placeables (Chairs, tables, etc) as well, so you can make sure everything corresponds to your color theme. That’s all for this time folks! Have a good weekend and as always, please tell us what you think of the new stuff! I knew they were for paint! Firstly you have done some work on the Islands, and they look lovely. The reefs are going to be exciting, and i’d like to paint my raft very much! Do you think you will make it so we can somehow import our saves from the prototype? Amazing game so far! I will instantly buy it when available on steam! – Bows, to shoot those seagulls out of the sky! Bows need arrows to work of course. 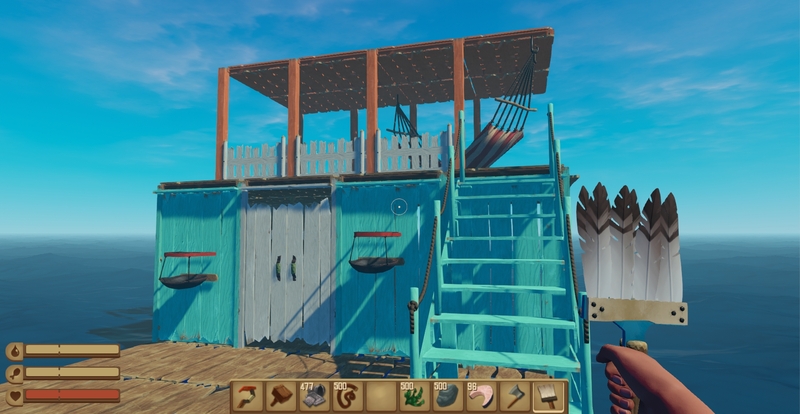 If you have two rafts (some planks broke in the middle) will you be able to control the other one separately? I WANNA PLAY IT ALREADY! I´ts AMAZING! This game looks so fantastic, I cant wait to play it! I love all the hard work you have put in it, and it makes me happier and more excited to play when it comes out! Saw this game in steam, honestly pumped to play this ASAP great work on your end wow! Cant wait to see whats in the next Blog.